Recently our search code has undergone a major update to give you greater control over what text you can find. 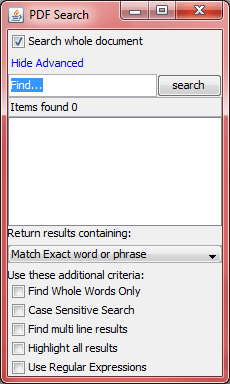 We have now made the search functionality capable of understanding regular expressions. When using the simpleviewer it is easy to activate this feature by selecting the option found under the advanced options menu (shown below). In order to activate this functionality with code you need only to pass through the correct searchType flag. By ensuring the search type passed into any of the search methods includes the above flag you will be able to use regular expression symbols in your search. This improvement has not just improved the search capabilities but also allows for a multitude of “dumb” searchs (a search not using regular expressions) to take place at the same time with almost no increase into the speed of the search (approx. 0.02 – 0.05 seconds increase per page on test files) without having to manually perform each search for every possibility the regular expression would catch. With this new functionality, JPedals search functions now have a lot more possibilities and potential uses for you. What will you use it for? 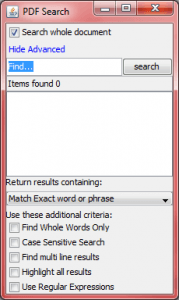 This article is part of our Search PDF Files With Regular Expressions series. The articles in this series covers our use of regular expressions with jPedal in order to search PDF files. By using the link above you will find the other articles in the series.